hot and ready to eat on go. 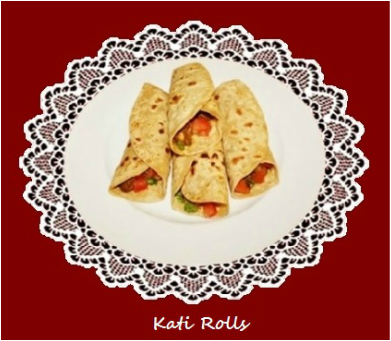 Kathi roll is originated from Kolkata. In Bengali, skewers means kati or stick hence derived its name as kati roll. The name eventually became synonymous with any kind of paratha rolled with stuffing called kati roll. Mumbai they are commonly known as Frankie. 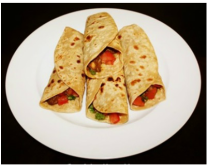 Traditionally, a kati roll is a kati kebab wrapped in a paratha and prepared with lamb meat. Over the years they become very popular, and there are a large number of varieties available, like filled with curried beef, curried chicken, paneer, lamb, shrimp and vegetables. Today, pretty much any filling rolled up in any kind of Indian flatbread is called a kati roll. Usually Kati rolls are a mixture of spicy meat, vegetable or paneer topped with finely chopped onions, tomatoes, coriander leaves and lively chutneys rolled in flat bread (wrap). These delicious Kati rolls are great for snack and also make a really nice casual dinner, and are a fantastic wrap to take for lunch and they even taste better next day. Kathi roll's recipe seems complicated and lengthy, but they are easy to make. All purpose or whole wheat tortillas could be used as a wrap or in India roomali roti could by purchased from the dhabas (street stalls) for wrap.